Marshall Goes Acoustic With This Feature-Packed, Gig-Ready Amp! The plug-and-play Marshall AS50D acoustic guitar amplifier is the singer/songwriter's best friend for acoustic shows in small to mid-sized rooms. This 50-watt powered acoustic amp gives you two channels with two-band EQ controls, onboard chorus and reverb effects, an effects loop, a super-useful feedback control filter, line and DI outs, two instrument inputs, one XLR input, and one RCA stereo input if you want to play your own "house" music before and after your set. You'll be able to control more from the stage with this helpful amp, and with a Poly-dome tweeter to accompany your two 8" speakers, your playing will consistently sound clear, smooth, and well-defined throughout your set. When venues tend to have a DIY atmosphere to them, it's good to know that you can count on your own gear to keep things running smoothly. Your Marshall AS50D acoustic amplifier has an RCA stereo input if you want to plug your iPod or cd player in for some "house" music before or after your set. If the venue you're playing at does have a mixer, your AS50D has DI outs, so you have the option of wiring into the PA system if you want. To sweeten up your tone a little bit, your AS50D comes with a nice set of onboard effects. Create an atmospheric allure with your reverb controls, including a balance knob to shift your reverb across both of your channels. This baby also has a mesmerizing chorus effect with speed and depth controls. Both of the AS50D's channels come with a nice set of controls to modify your tone to your personal liking. Channel one hosts its own high impedance 1/4" input and volume, bass, and treble controls. Your second channel also has its own 1/4" input, and two-band EQ controls plus a balanced phantom-powered XLR input and a stereo RCA input if you want to use your AS50D to reinforce vocals or a backing track. You can also balance your parallel effects loop across both channels. One handy feature on your AS50D acoustic amplifier is the onboard feedback control filter. If your signal starts getting a bit too hot, your frequency sweep control will help you locate the source of the unwanted sound. There is also a phase switch and a notch switch to change where your frequency control does its sweeping. You'll be able to get a clean, feedback-free tone without sacrificing too much from your EQ settings. 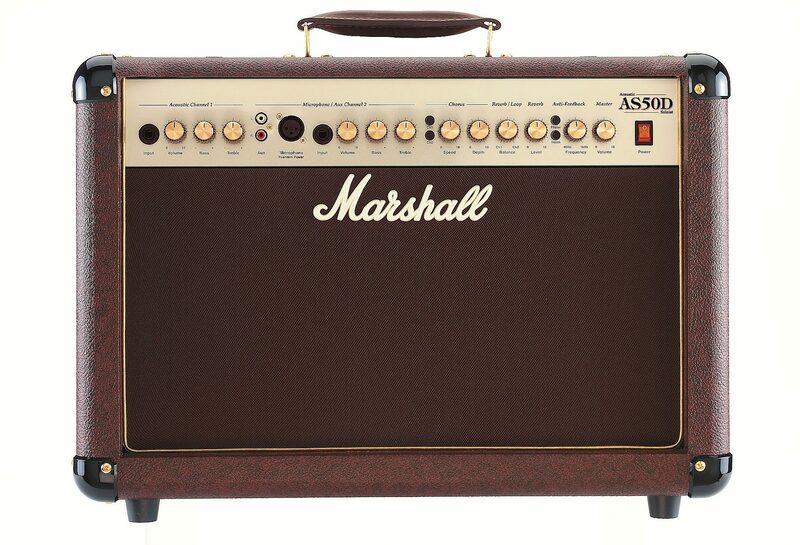 zZounds is an authorized dealer of Marshall products. - Speakers: 2 x 8"
Believe it or not, the Marshall design team does not consist solely of metal heads, rockers, and blues lovers. Their critically-acclaimed, award-winning acoustic combos, the AS100D and the AS50D, are further proof of the diversity of expertise within the Marshall design team. Built upon the award-winning AS50R, this superb amplifier features a tweeter, a phantom-powered microphone channel, digital chorus and reverb. The AS50D allows you to express your emotions with passion. This compact and highly portable combo features two channels, each of which has its own independent volume and tone controls. A variety of inputs give the AS50D the ability to handle all-comers: the high-impedance input on Channel 1 is perfect for piezo or magnetic pickups. Channel 2 boasts RCA phono inputs plus a balanced phantom-powered XLR-type input in addition to its jack input, making it the perfect host for voice, instrument, or even backing track. The AS50D also contains a high-quality digital effects section featuring an adjustable Chorus which can be assigned to either or both channels, also a reverb. It also has a parallel Effects Loop that can be balanced between the two channels. One of the most difficult aspects of amplifying certain acoustic instruments is feedback. Therefore, anti-feedback controls include a Phase switch and a frequency-controllable Notch Filter. Another useful AS50D feature is an internal Limiter which allows you to drive the maximum level from the 50-watt power stage, yet remain distortion free. Neat and affordable, flexible and portable, the AS50D is ideal for the acoustic musician who wants an amp which is perfectly suited to intimate gigs. "Best acoustic amp the the money." Sound: I tried several acoustic amps head to head at my local music store. It didn't take long to realize that for the money, nothing beat the clean, warm sound for this Marshall amp. I play several different guitars through it, as well as a mic and the sound is clear, clean and fits the actual sound of each of my guitars. Feature: I use the reverb and chorus sparingly if at all but for the guitar channel it is sufficient. I use the line out for recording and it produces a clean accurate sound. For gigs I use the direct out to my PA which along with the amp produces a full, nice and powerful sound. No headphone jack? While the anti-feedback features helped a little, it still doesn't do the job of a dedicated anti-feedback rack. Ease of Use: It didn't take long to get a great sound from this amp. Very easy to dial it in. Quality: Its a Marshall! Looks great. Appears well made. I have used it for two months and have had no problems with it at all. Value: As I said earlier, I tried out several of the name brand acoustic amps head to head at my local music store and for the money, nothing came close to this amp as far as sound and features. Manufacturer Support: There is no selection indicating that I haven't had to use customer support, which I haven't so I have no opinnion. The Wow Factor: Hey, its a Marshall! It looks great and I didn't hesitate to purchase it. Overall: I think I will be using this amp for a long, long time. 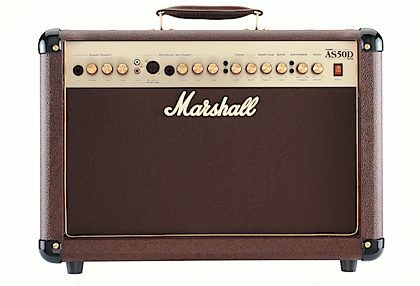 The only reason I would have to purchase another would be the need for more power and then I would purchase the Marshall 100 watt amp. Everyone who has heard and used this amp in my studio and at gigs loves it. 67 of 67 people (100%) found this review helpful. Did you? "Excellent Amp for your Accoustic Guitar"
Sound: I do not play professionally, I play at home, so I thought I would not need any more oomph than the AS50D, and I was right because this thing packs a punch! It is more than plenty loud to gig with and if you need more power, then the AS100D is available. This amp nails it so spot on for me that I leave my guitar and the amps EQ's dead flat, no gain or loss on anything, and I find the crystal clear sound from each note to be bright and right where I want it. I am free to add Bass, Mids and Highs however I need them later if I choose, but I am happy where its at. Excellent job a reproducing the acoustic sound. Feature: Pretty much has all you need for an acoustic amp. The acoustic sound is the star of course, and to compliment that there is a Chorus effect and Reverb that you can add. There is an aux second channel that you can add a mic into and it has phantom power. You can also add chorus and reverb to the second channel. This amp also features some good anti feedback options to help you eliminate those frequencies that just can't seem to control themselves! Ease of Use: Very easy to use, as intuitive as any amp but made specifically for acoustic sound. Quality: Its a well made Marshall amp, the quality is very good. I don't gig so I don't carry it around with me, but I would imagine it would hold up about as well as other Marshalls out there. Value: If you like the rich sound of a plugged in acoustic guitar, then you will not regret this amp. If you don't mind the muddier/warmer sound of a regular amp for your acoustic then stick with that, it just depends on how much more true acoustic tone you want out of your amp. Manufacturer Support: Never needed it so far... The Wow Factor: The wow factor is the sound. This is a great amp. The quality of the build adds to that and the brown/gold look adds an old school look to it too. Overall: I decided to get an acoustic amp to go with a new Takemine I bought. The guitar already sounded good through my Bugera v22 Vintage amp but it is night and day compared to this amp. The true character of the acoustic guitar sound really shines through on a well made amp such as this and its bigger brother, the AS100D. Don't get me wrong, I love my Bugera v22, but there is no way I can get the clean ringing notes from my acoustic like I can from this Marshall. I would highly recommend any acoustic player check out these well made and really good sounding Marshall amps.